Guard Sug Sutton scored a game-high 18 points to help lead the No. 12 Texas women's basketball team to a 62-43 win over Kansas (photo courtesy of texassports.com). AUSTIN, Texas — Juniors Sug Sutton and Joyner Holmes combined for 33 points to lead the No. 12 Texas women’s basketball team to a 62-43 win over Kansas Wednesday at the Frank Erwin Center. The victory improved the Longhorns’ record to 16-3 overall, and 6-1 against Big 12 opponents, while KU fell to 11-6 overall and 1-5 in Big 12 games. Sutton hit five of seven shots from the floor, and eight of nine from the free throw line, en route to her game-high 18 points, and pulled down six rebounds. Holmes, meanwhile, finished two rebounds shy of a double-double while scoring 15 points and snatching a pair of steals. The Longhorns shot 50 percent on field goals, connecting on 24 of 48 shots from the floor, hitting at least half of their field goal attempts for the fifth time this season. UT also outrebounded its guests by a 42-36 margin. 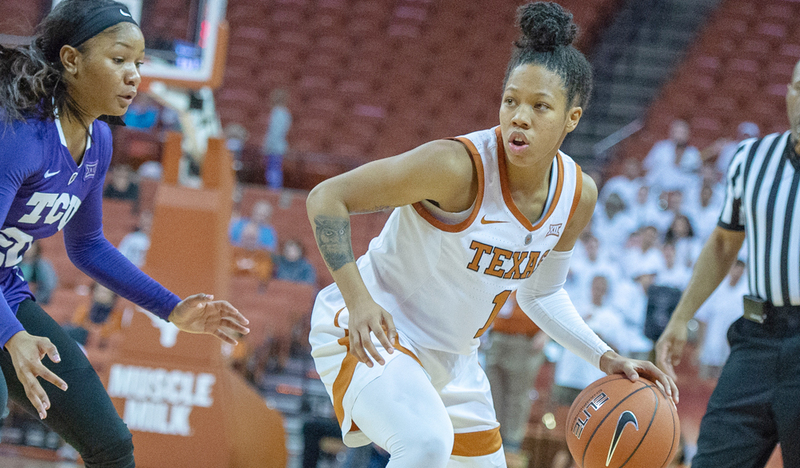 Senior forward Jatarie White had 10 points and five rebounds in the Longhorns’ victory. The Longhorns now head out on the road, traveling west to Lubbock to face Texas Tech at 12 p.m. Saturday in a game that will be streamed on TexasTech.TV and can be heard on 105.3 FM in Austin.